Another image from the Walker Art Center Sculpture Garden in Minneapolis, MN. [I kinda wish it was an apple as many Minneapolitans like to refer to the city as the Mini-apple]. Oldenberg is a favorite sculptor of mine. My heritage is Dutch and Swedish so this couple matches up well with me. A giant ice cream cone, a huge electric plug, an enormous bag of French fries—with his surprising representations of everyday things, Claes Oldenburg became a key voice in Pop Art, a 1960s movement that saw many artists turning to advertising and consumer products for subject matter. By the early 1980s, he had begun to make monumental outdoor works with Coosje van Bruggen, his wife and artistic partner. Spoonbridge and Cherry is one of their most celebrated collaborations. It was the first work commissioned for the Minneapolis Sculpture Garden, which opened in 1988.
this, the artists envisioned a gigantic utensil as a fanciful bridge over a pond. In considering Minnesota as a site, they compared the spoon’s raised bowl to the prow of a Viking ship or a duck bobbing in a lake. Van Bruggen added the cherry, a personal symbol recalling happy moments in a childhood clouded by World War II. 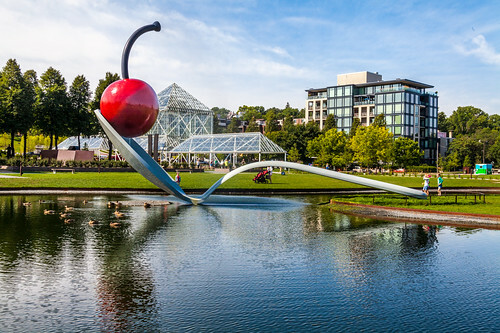 At more than 50 feet long, Spoonbridge and Cherry has delighted visitors ever since and is now a familiar and iconic symbol for the Twin Cities.